We've all been there, the dreaded dead arm from spooning your other half. Well, having to disturb your partner or commit to the dead arm is no longer necessary. The Coodle was created by US couple Bob and Shirley. 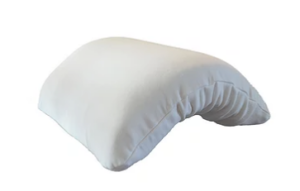 The specially designed pillow has a curved brace covered in foam, making it comfortable for both parties. Bob created the Coodle at home after experiencing the problems that come with being the big spoon. "The idea came to him after his girlfriend was lying on his arm while watching tv. He cut foam and bent plastic in his oven until he came up with a tunnel shaped pillow." Couples might finally be able to say goodbye to the infamous "hug and roll" technique. The Coodle is currently only available on Amazon in America but hopefully it will make it's way across to us soon.